Tucson AZ golf courses include the Fred Enke Golf Course. 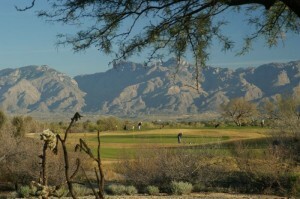 It is a true desert golf experience among the Tucson AZ golf courses. Fred Enke’s interesting features are its vast teeing areas, large greens, strategic bunkers and sand traps and its creation as a semi-arid, limited turf course. Fred Enke is one of the golf courses in Tucson that has grass only on the tees, ball landing areas, and greens. It has undisturbed native plants covering the remainder of the landscaping. Fred Enke is one of the better courses among the Tucson AZ golf courses. With 4 teeing areas on each hole, players can challenge their skills from 5,000 to 6,800 yards. Because of its rather hilly terrain, golf carts are recommended. The first few times you play this course, you won’t have a clue where you’re supposed to put the ball on some holes. However, if you give the course a chance, it may turn out to be one of your favorite tracks in Tucson. As one of the municipal Tucson AZ golf courses, the desert is a bit of a challenge. If you hit your ball into the “stuff”, you may not want to go looking for it. Lots of road runners and coyote, even the occasional bobcat. Once you learn your way around the course, it will likely become one your favorites. The 9th is really tough to par. Only complaint is the rather ordinary finishing hole. Otherwise a great desert layout! Opened in December of 1983 and located on the South side of Tucson. As with many Tucson Golf Courses, the photo opps abound. Fred Enke Golf Course is locate East of Kolb on Irvington. Want to have daily email updates of homes for sale in Tucson AZ Or specific Tucson neighborhoods? We can help!